The caption to this photo in the LA Times is a classic illustration of media narrative on Palestinians & Israel. 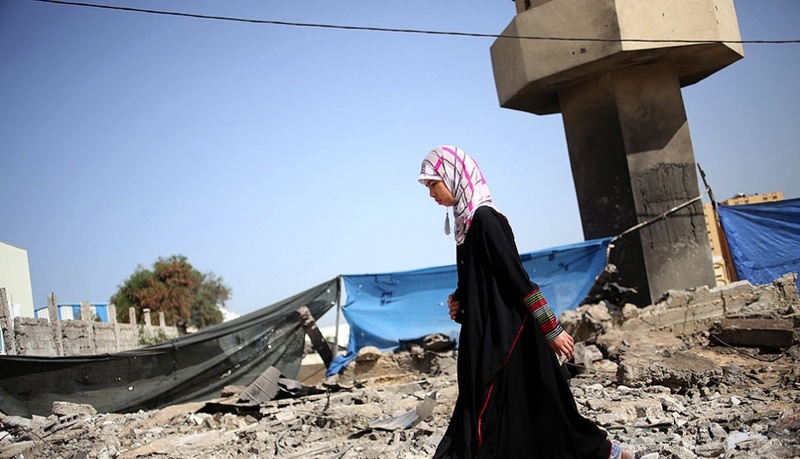 It reads: “A Palestinian girl walks past the rubble of a destroyed Hamas site after Israeli air strikes in the northern Gaza Strip. Israeli military said it carried out airstrikes on five weapons & militant sites in Gaza, following overnight rocket fire from the coastal strip into Israel.” It’s only a caption but it doesn’t exhibit the honesty considered de rigueur to most second-graders. Why all the media flap over plagiarism by journalists when they won’t even tell the straight story? What’s cribbing even entire paragraphs compared to making up the whole story? Let’s parse that caption a little because whatever their political failings, Hamas is the elected government of Gaza. So is that “destroyed Hamas site” where they store municipal supplies like shovels? Did they store court files in there or toilet paper for the government buildings? Or was it an arsenal as the Israeli military claims? And an arsenal of what? Here’s where that “integrity in journalism” thing comes in: would intrepid reporters with an ounce of integrity simply accept the word of the aggressing party for why they bombed? Or is that shyster journalism of the same kind where media accepts Pentagon press releases as oracular? In other words, is it BS? Can they provide one shred of documentation that those rockets were actually set off or that they came from Gaza? We’ll take even a shred of documentation. Originally when the bombing began this weekend in Gaza, reports said the forays were over the Khan Yunis region south of Gaza City but later reports indicate they also included Gaza City. There are no final reports yet on fatalities & property damage.